From the initial 4 banana shallots I planted in the ground this season, we have harvested in total, 4. Pitiful, right? Well, I guess it’s not that bad when I think about it – there are still 2 in the ground that have gone to flower so I can get the seeds for next year. There are others that rotted away when I took them out of the ground. In terms of returns for my effort, I’d probably have said marginal, until today! 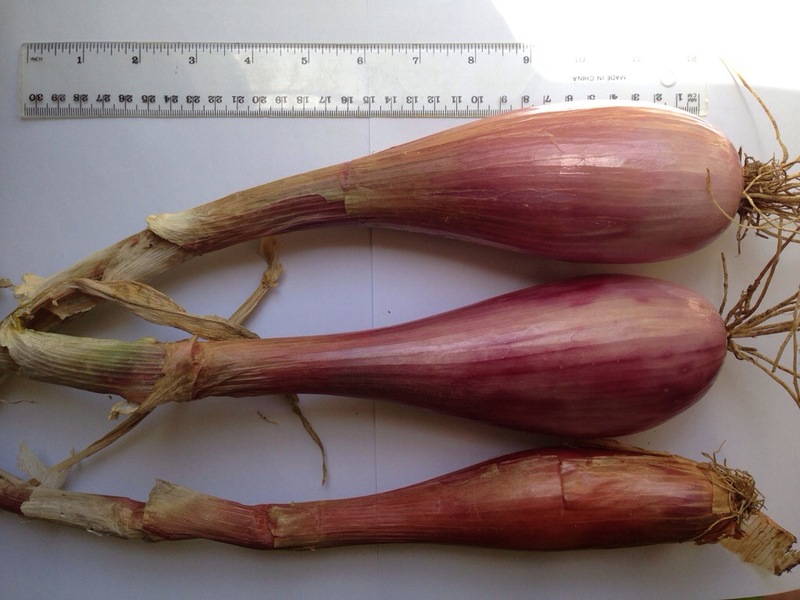 The stems of two shallots had bent over. It could have been due to the strong wind last night, but a limp stem is also a sign sometimes that they are ready to be harvested. I tried pulling them out by hand but they would not budge, so I used a garden fork to coax them out. To my surprise, I harvested 2 giant individuals. See the photo below. A normal sized one was placed next to them for comparison. They are 6 centimeters across at their widest. I’m not sure if they are meant to get that big (like… it might be a normal thing… and I’m just easily excited so apologies, or, they really are big!). But compared to everything else I have harvested, they are biggggggg. I can’t remember doing anything special to them. The only ‘special’ thing I did was water them with compost tea a few times in their early stages of growth – then I couldn’t be bothered making any more so just watered them regularly with monthly boosts of potash & dynamic lifter. Thanks. What do you want to contact me about?